TYSONS, Va., Oct. 30, 2018 (GLOBE NEWSWIRE) -- Alarm.com (Nasdaq: ALRM), the leading platform for the intelligently connected property, announces a newly deployed artificial intelligence (AI) architecture and video analytics service. The Alarm.com platform can now monitor video streams in real-time and alert property owners about important events, while ignoring routine movement. The new service is available now for residential and business subscribers. Alarm.com's video analytics engine is optimized to address a wide variety of smart security applications with cost-effective video cameras on the edge. Alarm.com's computer vision research team trained the AI engine with millions of frames of video donated from field-deployed cameras, and extensive feedback from service provider partners and beta program participants. "Alarm.com's AI architecture and video analytics program are defining the next generation of smart home and business innovations," said Dan Kerzner, Alarm.com's Chief Product Officer. "We've been able to rapidly grow our data analytics program, thanks to the scale of our platform and the depth of our research and development efforts. Alarm.com's commitment to AI will enable our service provider partners to continue to deliver an unmatched smart home and business experience to millions of subscribers." 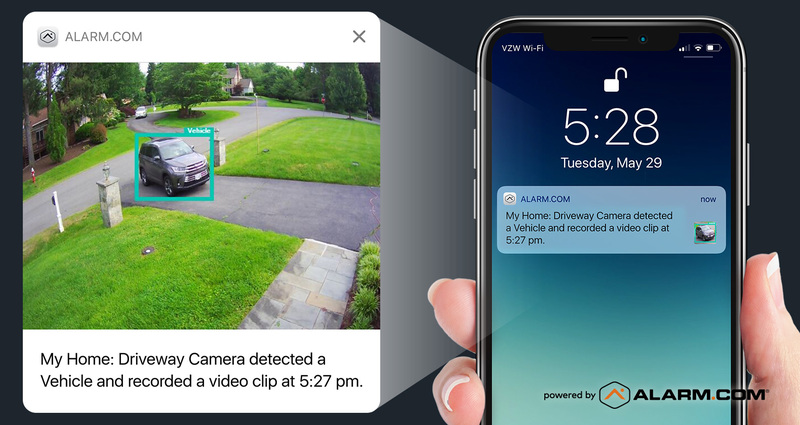 Alarm.com's video analytics engine provides an intelligent new layer of security and awareness for home and business owners. Object classification and object tracking technology can distinguish between people, vehicles and animals, determine an object's direction of movement, and measure the duration of activity. Alarm.com subscribers can selectively control and manage notifications and assign virtual zones and multi-directional "tripwires" so they can monitor their properties for highly specific activity. Vehicles coming and going: Know when a vehicle stops outside your home during the daytime, or if a vehicle leaves unexpectedly overnight. Lingering visitors: Get a video alert if someone lingers by your front door, but not when the mail is delivered. Pet protection: Know which neighbor's dog has been visiting your lawn. Know immediately if your own pet bends the rules and naps on the couch when you're at work. Automated deterrence: Set your lights and other home automation scenes to turn on when a person enters your backyard, but not when an animal enters. Vendor validation: Business managers can confirm that a delivery truck pulled into the loading dock, but won't be notified each time a customer exits the building. Video analytics is the latest in a line of proactive, intelligent safeguards that differentiate Alarm.com's smart home security solutions. Crash and Smash protection can deliver an alarm signal even when the panel is disabled. Unexpected Activity Alerts notify families or business managers about unusual events indicating potential safety or security issues, while Geo-Services triggers location-based reminders that make it easy to keep homes and businesses secure. Subscribers interested in activating video analytics should contact their Alarm.com service provider to learn about camera and service plan options.